VicLeka is a collaborative project by Vic Godard, British poet, singer/songwriter, pioneer of English punk and frontman of band Subway Sect and A.M.Leka, Serbian visual artist and professor at University of Arts in Belgrade. VICLEKA project is a creative dialogue between the poetry of Godard’s song lyrics and Leka’s artistic vision. The two artists have chosen 12 songs from Godard’s 40 years career in music. A Dyptich dedicated to each song incorporates Godard’s hand written lyrics and Leka’s visual interpretation, not an illustration of the song per se but a response to it. Context is sometimes social and engaged but the ingredients of all the works reflect the self deprecating dark humor of Godard’s writing. The Dyptichs are presented in and artist box that also includes Vic Godard’s CD “Live & Rare Vol.3-VicLeka” featuring rare recorded versions of the 12 chosen songs from the collaboration. Individual pieces will also be available. The exhibition also includes VicLeka Revisited, a series of Leka’s more recent works created from further inspiration found in Godard’s opus. Also Subway Sect-Nobody’s Scared series in which the artsit transfers lyrical and musical energy into visual chords. 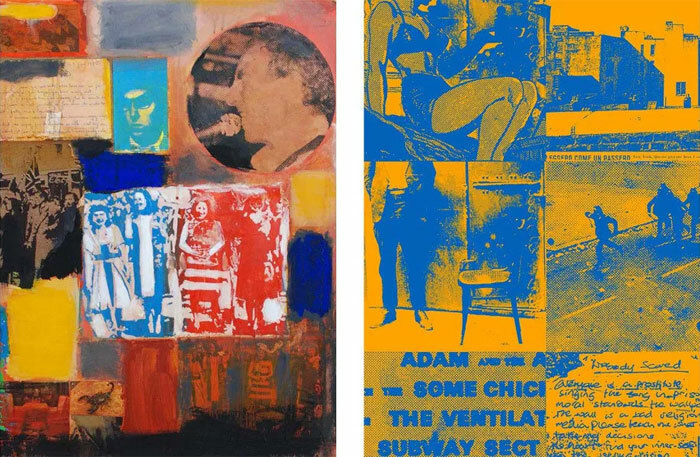 In all this work the artist’s fascination with the subculture of punk and his vibrant use of painting and printmaking as medium resonates. VicLeka had its UK premiere and was shortlisted at Print Awards exhibition in the framework of International Print Biennale 2016 in Gallery North, Newcastle.